Spend the 2nd (Tue) wandering through the wild on a nature and wildlife tour. On the 7th (Sun), spend a fun day on foot with Walking tours. And it doesn't end there: take an in-depth tour of Broome Historical Museum, enjoy the sand and surf at Cable Beach, get outside with Staircase To The Moon, and look for all kinds of wild species at Malcolm Douglas Crocodile Park and Animal Refuge. To see ratings, other places to visit, reviews, and other tourist information, read Broome trip maker app . Sydney to Broome is an approximately 8.5-hour flight. You can also drive; or do a combination of bus and train. The time zone difference moving from Australian Eastern Standard Time (New South Wales) (AEST) to Australian Western Standard Time (AWST) is minus 2 hours. While traveling from Sydney, expect warmer days and a bit warmer nights in Broome, ranging from highs of 35°C to lows of 17°C. Finish your sightseeing early on the 12th (Fri) so you can travel to Fitzroy Crossing. Fitzroy Crossing is a small town in the Kimberley region of Western Australia, east of Broome and west of Halls Creek. Start off your visit on the 13th (Sat): look for gifts at Dr. Sawfish Hot Glass Studio and then take in breathtaking views at Geikie Gorge National Park. For maps, other places to visit, and more tourist information, go to the Fitzroy Crossing itinerary planning app . You can drive from Broome to Fitzroy Crossing in 4.5 hours. Wrap up your sightseeing by early afternoon on the 13th (Sat) to allow enough time to travel to Purnululu National Park. Kick off your visit on the 14th (Sun): explore the striking landscape at Bungle Bungles Range and then take in the dramatic natural features at Bungle Bungle Range. On the 15th (Mon), you'll have a packed day of sightseeing: look for all kinds of wild species at Purnululu National Park. To see where to stay, reviews, maps, and more tourist information, refer to the Purnululu National Park trip planner . You can drive from Fitzroy Crossing to Purnululu National Park in 7.5 hours. Wrap up your sightseeing by early afternoon on the 15th (Mon) to allow time for travel to Kununurra. Spend the 18th (Thu) exploring nature at Mirima National Park. Spend the 20th (Sat) exploring nature at Mitchell River National Park. The adventure continues: tour the pleasant surroundings at El Questro Wilderness Park, explore the stunning scenery at Emma Gorge, look for all kinds of wild species at Parry Lagoons Nature Reserve, and view the masterpieces at Waringarri Aboriginal Arts. 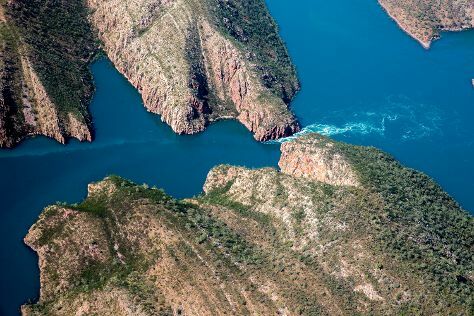 To see photos, more things to do, maps, and more tourist information, use the Kununurra sightseeing planner . Drive from Purnululu National Park to Kununurra in 6 hours. July in Kununurra sees daily highs of 36°C and lows of 16°C at night. Wrap up your sightseeing on the 22nd (Mon) to allow time to travel to Wyndham. Wyndham is the oldest and northernmost town in the Kimberley region of Western Australia, located on the Great Northern Highway, 2210km northeast of Perth. Start off your visit on the 23rd (Tue): look for all kinds of wild species at The Grotto, then don't miss a visit to Five Rivers Lookout, then make a trip to Wyndham Port and Jetty, and finally pause for some photo ops at Warriu Park Dreamtime Statues. Here are some ideas for day two: identify plant and animal life at Ord River Nature Reserve and then look for all kinds of wild species at Marlgu Billabong. To see traveler tips, where to stay, reviews, and more tourist information, use the Wyndham travel website . Traveling by car from Kununurra to Wyndham takes 1.5 hours. July in Wyndham sees daily highs of 36°C and lows of 16°C at night. Finish your sightseeing early on the 24th (Wed) to allow enough time to travel to Mitchell Plateau. Start off your visit on the 25th (Thu): don't miss a visit to DC3 Wreck Site, explore the striking landscape at Mitchell Plateau, and then contemplate the waterfront views at Mitchell Falls. Planning Mitchell Plateau trip won't be overwheling when you use's Insprock itinerary maker. Traveling by car from Wyndham to Mitchell Plateau takes 19.5 hours. Wrap up your sightseeing on the 25th (Thu) to allow time to travel to Talbot Bay. On the 26th (Fri), admire the sheer force of Horizontal Falls. To find ratings, maps, where to stay, and more tourist information, read Talbot Bay online trip itinerary planner . Explore your travel options from Mitchell Plateau to Talbot Bay with the Route module. On the 27th (Sat), you'll travel to Derby. Derby is a town in the Kimberley region of Western Australia. Derby is known for museums, nature, and wildlife. Your plan includes some of its best attractions: admire the masterpieces at Norval Gallery, take in the architecture and design of Kimberley School of the Air, get engrossed in the history at Wharfingers House Museum, and take in the waterfront at Derby Jetty & Wharf. To see photos, ratings, and other tourist information, read our Derby trip planner. Use the Route module to find suitable travel options from Talbot Bay to Derby. In July, plan for daily highs up to 36°C, and evening lows to 18°C. On the 30th (Tue), wrap the sightseeing up by early afternoon so you can travel to Dampier Peninsula. Kick off your visit on the 31st (Wed): explore the striking landscape at Cape Leveque. To see reviews, maps, more things to do, and other tourist information, read Dampier Peninsula trip itinerary planner . Traveling by car from Derby to Dampier Peninsula takes 5.5 hours. On the 1st (Thu), you're off tohome.